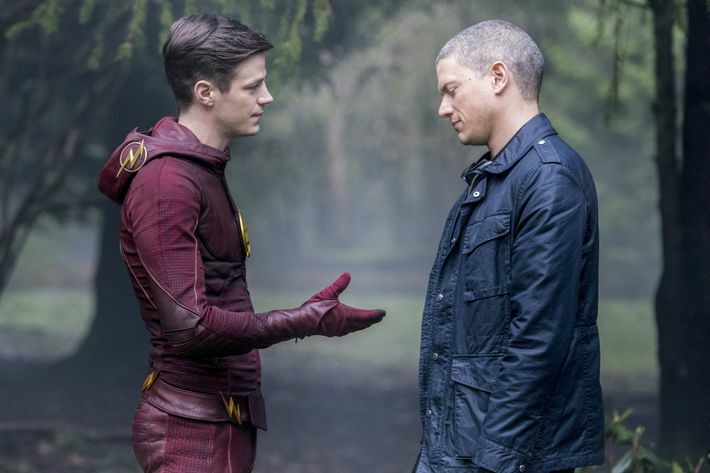 The Flash makes a deal with Snart (Captain Cold) in “Infantino Street” (Episode 22 of Season 3). For both professional and personal reasons, as of late I’ve been swimming through literature, podcasts, film and research all related to the concept of resilience. So as often happens, when my brain is steeping in thematically rich waters, I can no longer avoid catching a glimpse whatever the theme might be every.where.I.freaking.look. I see it in the spring blossoms and explosion of greenery up here in the Pacific Northwest after a ridiculously rainy winter. I see it in the faces of those whose stories of heartache I’ve been privileged enough to witness as they continue to pursue life despite having tasted or touched death in a multitude of ways. Last night, I was even struck by how a television series based on the DC Comics character, Barry Allen, explored the concept of resilience. That’s right. I am now considering The Flash as part of my research. I personally find Snart’s rules to be a little too fatalistic or pessimistic to cultivate a resiliency that is more characteristic of thriving as opposed to strictly adapting and surviving. And so as I play out this 4-part rhythm of sorts in my own mind, I keep trying to nuance the language of rules 3 and 4. Expecting the plan to go off the rails feels like a psychological defense against the vulnerability of hope. I imagine that this sort of defeatist expectation would permeate and impact the planning and execution stages of our movement through life’s varying chapters as well. AND YET. Here’s the thing. Assuming or visualizing or wishfully believing that life will go exactly as planned can also be a psychological defense (called denial) that leaves us completely ravaged when tragedy or disruption strikes. And it will strike. Our own mortality is evidence enough that suffering is a universal human experience. So I’m left wondering, how do we give ourselves fully to any kind of plan? How do we show up to the present moment(s) of our unique stories with hope and openness, desire and adaptability? Logic might argue that these are contradictory postures. But logic has never really been my best teacher. There have been a ridiculous amount of thwarted plans in the recent years of my own life. Plans to have an idyllic pregnancy and birthing experience went off the rails by way of placenta percreta and a near death experience. Plans to maintain some family and community stability in the teenage years of our older three daughters were obliterated with my husband’s sudden job loss resulting in an unexpected relocation. Plans to find and cultivate a new normal in this chapter are perpetually obliterated by the ups and downs of chronic illness and chronic pain conditions two of our daughters have been battling in recent months. We know a little something about making and executing plans that eventually go off the rails. So I hold plans a little looser than I once did. On my best days, the loosening grip is influenced by a posture of surrender and the awareness of my limited control, but there are days where it is more of a resignation because it feels pointless to hold onto anything very tightly. Throwing away the plan sounds violent to me. Surrendering the plan through the dance of grief feels richer and kinder and gentler. Somedays that dance looks like anger and frustration. Somedays it’s closer to sorrow and disappointment. I’m coming to understand that the movement of this dance is widening the space, opening up the previous boundaries of my own lived experiences. Only when more space is created am I able to accept the broadening of our story, the expansion of the dance floor. Surrendering the plan and dancing through the grief helps me feel my way to new (albeit ever-loosening) plans. Be sure to visit Goofy as he and I share a lot of common life answers. It’s how I sometimes get through the day. Always brings a smile, chuckle or out loud laughter. I always think WWJD and I hear “think of something fun”, Goofy works every time. It does not solve any problems but has always lowered the stress. Even if just for the moment. God knows you’ve had more than your share. Be it far from me to give you advice but I just wanted to share because I care. Have a great trip to the magical land of make believe.